Just moments after its announced that all four carriers will carry the upcoming Blackberry Z10 hardware, T-Mobile releases a brief statement on availability. Unfortunately, the release doesn’t offer specific details for price or availability, what it does tell us is that the Z10 will arrive on T-Mobile LTE ready. Yup, let’s hope it’s just the first of many LTE ready devices to launch in coming months. T-Mobile USA is excited to partner with Research In Motion Limited (RIM) to bring our customers the T-Mobile 4G LTE-enabled BlackBerry® Z10 powered by BlackBerry® 10. The BlackBerry Z10 is the first smartphone to launch with the re-designed, re-engineered and re-invented BlackBerry 10 platform, offering consumer and business customers alike a powerful and unique new mobile computing experience that is the fastest and most advanced BlackBerry smartphone yet. With the BlackBerry Z10, T-Mobile’s customers can take advantage of Unlimited Nationwide 4G Data, now with no annual contract, with a smartphone that continuously adapts to their needs. T-Mobile will also be bringing RIM’s new BlackBerry® Enterprise Service 10 enterprise mobility management solution to our portfolio. For our business customers in particular, BlackBerry Enterprise Service 10 delivers proven BlackBerry device management capabilities, along with rich management control through a single, easy to use administration console, making it easy to upgrade an existing BlackBerry Enterprise Server infrastructure and manage the robust BlackBerry Z10, as well as other devices. Customers interested in the BlackBerry Z10 from T-Mobile can register at http://explore.t-mobile.com/blackberry-10-Z. Additional details, including device availability and pricing, will be shared at a later date. Qualifying data plan required. LTE coverage planned in 2013; see http://newsroom.t-mobile.com/ for details. Qualifying rate plan required for LTE. LTE coverage planned for 2013. See T-Mobile.com for details. Device and screen images simulated. LTE is a trademark of ETSI. T-Mobile and the magenta color are registered trademarks of Deutsche Telekom AG. ©2013 T-Mobile USA, Inc. Qualifying rate plan required for LTE. LTE coverage planned for 2013. See T-Mobilecom for details. Device and screen images simulated. LTE is a trademark of ETSI. T-Mobile and the magenta color are registered trademarks of Deutsche Telekom AG. ©2013 T-Mobile USA, Inc. I would hope that just means instead of coming out with all new plans maybe they will only allow lte access on unlimited plans or higher and 2gb or lower plans won’t get lte access. Ummm…I would hope not. I shouldn’t have to upgrade my 2GB plan just to have access to LTE. That would just be silly. If I remember correctly (unless it changed), the Q10 will be launched after the Z10. But no LTE (or even 1900 mHz) in my area yet. Already signed up for notification! But yes. I’m starving for one of these. Unreal device. Thanks David for the link. what’s exactly unreal about it? Oh, I’m aware of those two being LTE capable. But neither of them have been up on T-Mobile’s site touting LTE capability from the get-go. The GN2 was a latent discovery that was revealed, and the new LTE ready GS3 isn’t advertised on the site yet. That leaves this one as the first handset to be “mentioned” by T-Mo. T-Mobile better have all mid to high end phones release this year be lte capable. I think i will wait on Gs4. They could have made it with a lot more style just seems boring. Not everyone likes a flashy style phone. I actually like the low key, simple design, matte looking finish. Now we just need to see how the hardware and os perform. As I always say, how much different can it be? A rectangle with a display on one side and a battery cover on the back. This BB looks pretty sleek to me. Understated sophistication exudes quality, professionalism. It reminds me of my wishing Nokia would have gone with Android. 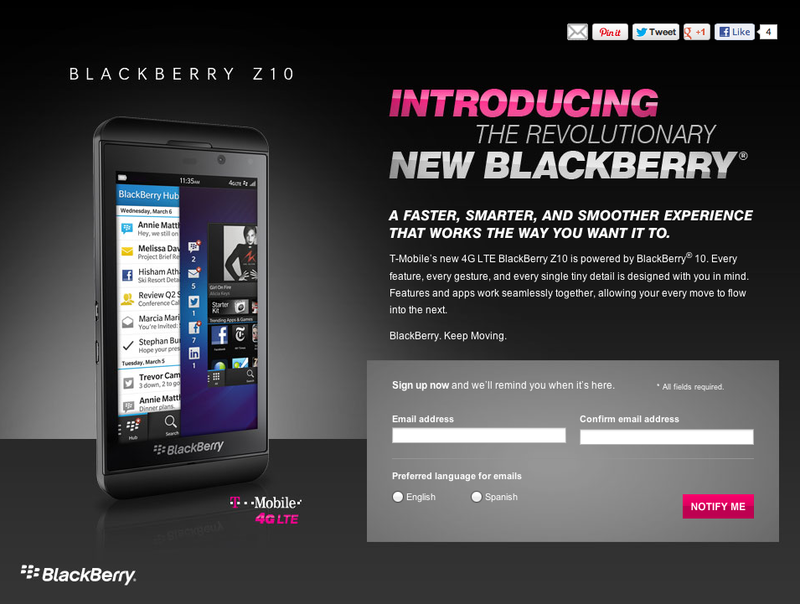 I’m all signed up and ready to get it on with the new BBZ10, amazing looking device. Woohoo! No more RIM, they are now just ‘Blackberry’ The press conference is online already..very nice. what about the one with a physical keypad? Not sure if they addressed this in their announcement today but the last word I read was that the Q10 (with keyboard) would release after the Z10. I also don’t know if all carriers will have it. Can we get it faster? Please! Who wants BlackBerry? They are just as bad as Windows Phone lmao…total yawnfest! I think I want one. I been wanting to try something new. Sometimes once you have something so long, you want to test the waters & see how the rest of the rivers, lakes, & oceans sail. The only thing that keeps me with Android is the abundance of apps, that’s about it. Well… now that & Google Music (I’ve start using that ever since my Zune was destroyed after 3 years. Certain apps I use on Android aren’t available on WP8 or Blackberry. More are starting to now, but some that I have even purchased aren’t, so it’s like meh…. Tho they both seem beautiful. Especially now having Windows 8 on my laptop, it really entices me to want a WP8. With Blackberry, I wanted one years ago, but I can’t remember why I didn’t make the switch. I want either this or a 4.5″ screen WP8 device. I think that developers eventually will add those apps to BB world since they want to gain customers, remember some games and popular like angry birds and smurf village or fruit ninja also. If the apps are not exclusive for any Os, then we will expect to have them in BB world. BlackBerry’s last stand. Lets hope OS 10 is actually worth it…..